When at school we had fantastic teachers. One such teacher was Mr. S, an Anglo-Indian who looked every inch a Brit. He handled Mathematics in classes X, XI and XII and how! He had an awesome sense of humour and made learning Mathematics a fun experience. We always waited for the Maths period. There was this guy in class who always went chatter … chatter … chatter. Mr. S noticed this and said, “I say Mister Shyam, you seem to be very excited man. Are you going to lay eggs? I have only known hens getting excited before they lay eggs. 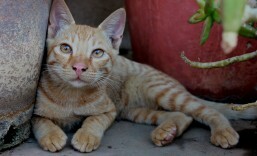 Yes?”. All of us burst into peals of laughter. There was this very short boy in class and he looked a wee bit young for his age. Mr. S called him ‘young chap’. Once ‘young chap’ was very distracted in class and started disturbing his neighbours. Mr. S noticed this. He rolled up his long notebook like a scroll and stood in front of ‘young chap’ with scroll in hand. He then struck a Kapil Dev-like pose and almost struck ‘young chap’ with the scroll like a cricketer strikes a bat with a ball and said, “Young chap shall I hit you for a six?”. Mr. S looked so funny in his cricketer-like avatar and ‘young chap’s’ expression of total bewilderment was so priceless that the rest of the class roared with laughter. A month before Sports Day we had march-past practice. Not all of us made it to the final day. If anyone of us marched sloppily he or she would get thrown out. I belonged to this brigade of clumsy legs. Getting thrown out was a painful process. The Prefect would yell out our name and say “Leave” in a very authoritative tone. In my last year at school I thought I would skip this hateful procedure altogether and took refuge under a desk in our empty classroom. I had to hide because it was mandatory that every one of us take part in the march-past till of course we got eliminated. For company I had Miss G aka Boy George, the class tomboy and the most mischievous girl in our class. Unfortunately someone spotted us in our hideout and reported the matter to Mr. S who also happened to be our Headmaster. Mr. S let out a shout as he approached our classroom, “Ladies hiding in the classroom leave at once and go join march-past practice”. This made me awfully nervous and I decided to go to the playground after rendering an apology to Mr. S. Never one to give in so easily Miss G had other ideas. She pulled me and said “Run”. Both of us ran like frightened animals along the long corridor. Mr. S noticed us running and gave us a hot chase with cane in hand. When we approached the ‘Ladies Toilet’ at the other end of the corridor, Miss G shoved me in and followed suit. She gestured me to move behind a wall in the loo. “Sssssh … he won’t enter here, don’t worry”, she said. How wrong she was! Just when we started thinking how long we would have to spend in the loo we heard footsteps. Mr. S found us out again. He stood at the toilet entrance and said, “Ladies, I know both of you are in there. Come out will you?“. Miss G started chuckling. Again I almost gave in and thought of leaving for the playground. Miss G would have none of it. She said, “Quiet”. Mr. S would have stood outside the toilet for well over 10 minutes before he finally decided to leave. Later he would say to me, “My girl I never expected this from you“. Miss G who was known for her mischief was never questioned. Thanks to the kind-heartedness of Mr. S we were let off very easily I should say. Any other master would have sent us to the cleaners. Not wanting another ‘loo episode’, the next day both of us were on the field joining the others at the march-past practice but not for long. I missed seeing a pothole and tripped and was sent to the bench only to be greeted by Miss G who was asked to leave after she inadvertently stamped someone’s foot. She flashed her pearls at me and gave me a big hug in a grand gesture of mutual admiration. Mr. S and Miss G were among those who made my school life so colourful and memorable. There is more to Gurudev Rabindranath Tagore than his being the creator of our National Anthem, his Nobel Prize winning work Gitanjali, his university Shantiniketan and his songs famously known as Rabindra Sangeet. Not many of us know that this literary genius was also a great artist. What is more amazing is that he took to painting seriously only at age 67 and has to his credit a whopping 2500 paintings. what words could not express. Interestingly, Tagore had dabbled with painting earlier in his life but somehow didn’t like the look of his works and lost interest in pursuing this line. He had the habit of drawing very pretty doodles when writing. And when he struck out words he transformed them into ornamental motifs which bore a strong resemblance to art-nouveau-like arabesque (see picture below of a scored out page). 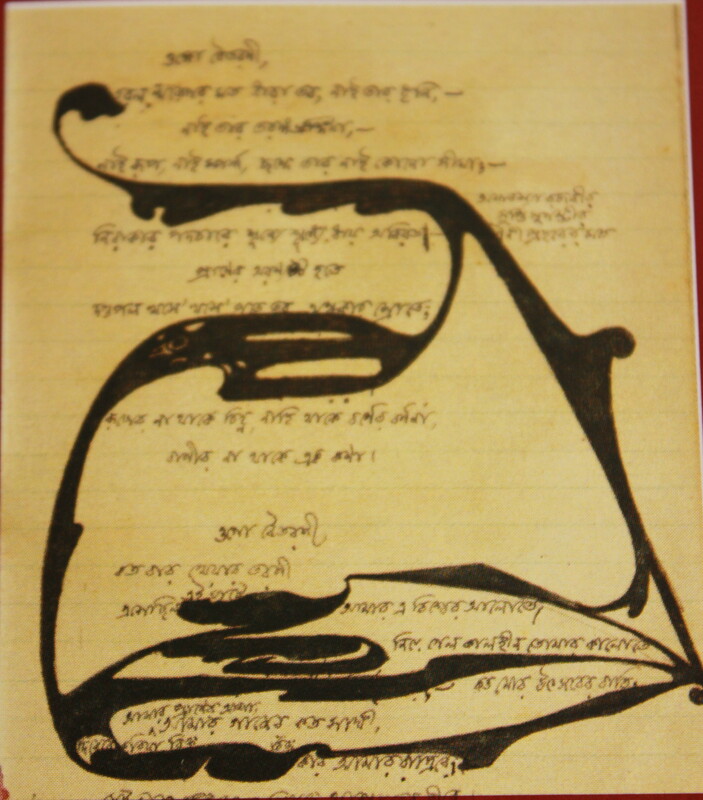 During a trip to Argentina in 1924, Tagore’s impressive motifs were noticed by writer Victoria Ocampo and she was mighty impressed, “He played with erasures following them from verse to verse with his pen, making lines that suddenly jumped into life out this play: prehistoric monsters, birds, faces appeared.” Later in 1930, it was Ocampo who helped Tagore put up his first exhibition of paintings in Paris. Ocampo’s role in shaping Tagore’s stint as a painter is celebrated in a Rabindra Sangeet composition where she is fondly referred to as ‘Bideshini’. Tagore never titled his paintings because he wanted them to be free of literary imagination. In the words of Prof. Siva Kumar, “he encourages the viewers to embark on a curatorial process. This exhibition is one such effort”. 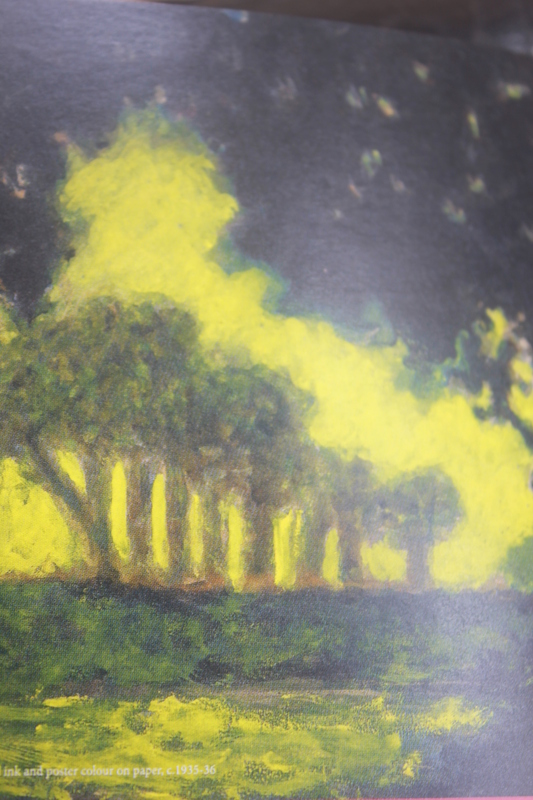 A landscape painting by Tagore. 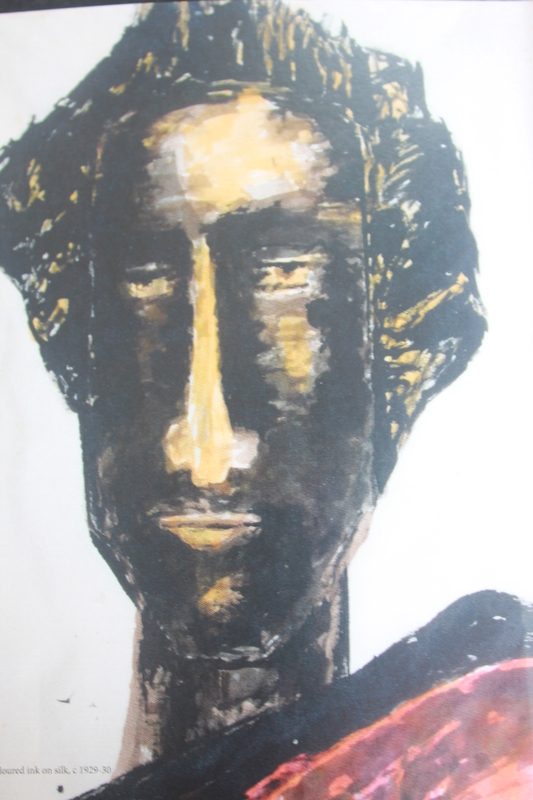 He used ink, poster colours, water colours, pastels on mediums ranging from paper to tinted paper to silk, brown paper, folder paper and more. 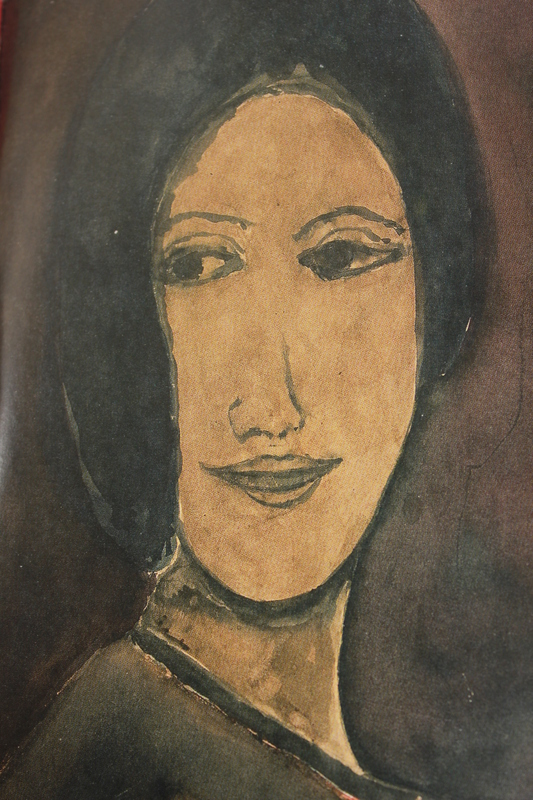 A lot of Tagore’s paintings are representations of the human face. Rabindranath Tagore was a genius. Men like him are rarely born. However, his successful stint as an artist beginning at the age of 67 reinforces the fact that it is never too late to be whoever you want to be and should serve as an inspiration for the generations to come. For those interested, the Bangalore exhibition is on at the National Gallery of Modern Art till the 14th of August, 2013. – Amazing use of light. Half of the woman’s face is lit. When I think of the 70s, a sea of memories, all of them sweet, engulf me. A 70s child, I have spent all my life in what was once a ‘Paradise on Earth’. I am not speaking about Kashmir but our very own ‘Garden City’ Bangalore, the ‘air-conditioned city’ of India. I was doubly fortunate to have spent a major part of my life, an entire 30 years, amidst the verdant greens of the NAL Colony campus, which is situated on what is now the Old Airport Road. My sweetest memories are of my childhood. Back then sparrows were in abundance, and crows cawed in gay abandon. Grey hares darted across at break-neck speed and mongoose would take cover at the blink of an eye. I would scream at the sight of these very large and neon-hued insects which I guess were a variety of grasshopper. A couple of times I even spotted foxes. There was an army of stray dogs around, all of them well-fed by the colony inhabitants. Pat, a handsome snow-white fella, was everyone’s favourite. Jimmi and her brood of puppies were much adored. Hide-and-seek was a hot favourite with us children. The endless trees and lamp-posts were ideal hideouts. The roads that hardly saw vehicles doubled up as cricket grounds. We didn’t have any cricket gear. The concrete dustbins served as wickets. ‘Gilli-danda’, ‘lagori’, marbles and spinning tops were the other favourites. Cycling to school was a pleasure. I loved the 3-km ride from home to my school via the Old Airport Road with the occasional breeze caressing against my face and blowing my hair. It would take me around 20 to 30 minutes to and fro. I must say I was not a very good cyclist yet I dared to take my bike on the main road. I have to thank the hardly there traffic for this. My cycle was a tad too small for me. Someone once screamed across the road, “Hey, the cycle is too small for you”, but I hardly cared. The size of the cycle hardly mattered to me; the road ahead was too fascinating. I played hockey at school and was part of the school team. The matches were held at the Sullivan Police Ground on Magrath Road. After every match we girls (around ten of us) would cycle back home via MG Road even as we relished a Joy ice-cream candy. Sometimes we would occupy the whole breadth of the road and a couple of us would make way for the odd car, auto, scooter or whatever. BTS (which is now known as BMTC) buses were very few. Back then the public transport was very poor. As years rolled by I gradually let go of cycling because the roads were no longer what they used to be. Traffic density has increased in the city making it impossible to cycle. 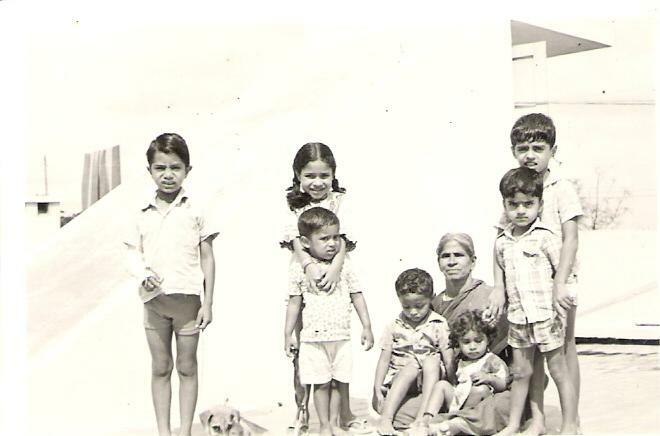 Like many, I miss my childhood and I miss the Bangalore of yore. With large-scale development, gone is what-was-once an enchantingly beautiful cityscape. The city’s famous green cover is no longer what it once was. Wonder where all the hare, mongoose, foxes and sparrows have gone. Only memories remain.